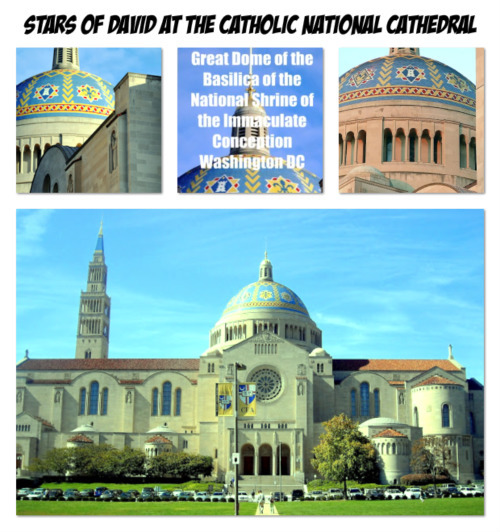 Star of David Ikon – Largest Catholic Church in U.S.A. 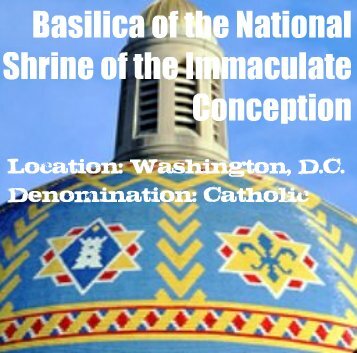 The Basilica of the National Shrine of the Immaculate Conception is a prominent Latin Rite Catholic basilica located in Washington, D.C., honoring the Blessed Virgin Mary as Our Lady of the Immaculate Conception, the Patroness of the United States. 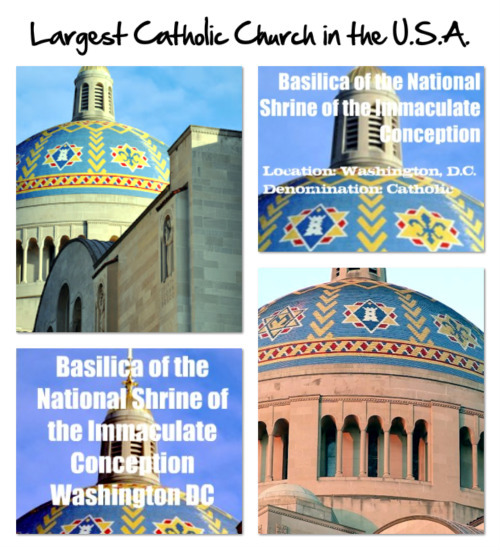 It is the largest Catholic church in the United States, the eighth largest religious structure in the world, and the tallest building in Washington, D.C.
Posted in: Judeo/Christian	| Tagged: Catholic Church, Star of David, Star of Mary, U.S.A. The Roman Catholic Mass is a Satanic mockery of the sacrifice of Jesus Christ for the sins of the world! Adam Weishaupt, a Catholic Jesuit priest [created] the Illuminati in 1776 as a front group for the Jesuits, and in reorganizing the Freemasons. They used the Jewish Talmud, a book of Jewish traditions and antichrist principles, to gain control. THE MISLED AND CONFUSED: The Roman Catholic Mass is a Satanic mockery of the sacrifice of Jesus Christ for the sins of the world! THE MISLED AND CONFUSED: Adam Weishaupt, a Catholic Jesuit priest [created] the Illuminati in 1776 as a front group for the Jesuits, and in reorganizing the Freemasons. They used the Jewish Talmud, a book of Jewish traditions and antichrist principles, to gain control. A CONCERNED CATHOLIC BELIEVER: It is a historical fact that Adam Weishaupt was never ordained as a Catholic Priest, let alone a Jesuit Priest. Founded in 1776, Adam Weishaupt’s organization achieved a short lifespan of popular support but was basically extinct by the end of the year 1785, or as Trevor W. McKeown notes ‘In March and August 1785…the Order (Illuminati) began to decline, so that by the end of the eighteenth century it had ceased to exist.’ (A Bavarian Illuminati primer, by Trevor W. McKeown). There is absolutely no historical evidence that the Illuminati, or its Founder Adam Weishaupt, knew anything at all about the Jewish Talmud and none of their writings ever mention this ancient Jewish religious text. CATHOLIC MASS: The Catholic sacrifice of the Mass is taken from the Jewish rituals and has slight influences brought in from Roman and other Middle Eastern civilizations. 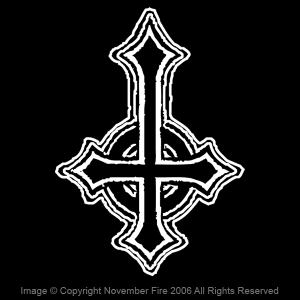 However, the Mass is modeled on the Jewish synagogue meetings and the temple sacrifices, hence its division from a strictly didactic format (the first half of Mass) to a form of ritual worship and sacrifice (the latter half). THE ILLUMINATI: The Order [of the Illuminati] was at first very popular, and enrolled no less than two thousand names upon its registers…. Its Lodges were to be found in France, Belgium, Holland, Denmark, Sweden, Poland, Hungary, and Italy. Knigge Baron Adolph Knigge (1752 – 1796), who was one of its most prominent working members, and the auther of several of its Degrees, was a religious man, and would never have united with it had its object been, as has been charged, to abolish Christianity. But it cannot be denied, that in the process of time abuses had crept into the Institution and that by the influence of unworthy men, the system became corrupted; yet the course accusations of Barruel and Robison are known to be exaggerated, and some of them altogether false…. The Edicts [on June 22, 1784, for its suppression] of the Elector of Bavaria [Duke Karl Theodor] were repeated in March and August, 1785 and the Order began to decline, so that by the end of the eighteenth century it had ceased to exist.